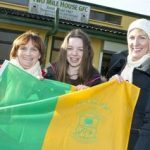 IF the size of an achievement by a GAA club is measured by the knock-on effect within their local community then Two Mile House have been paid the ultimate compliment. This weekend, Sunday mass at St Peter’s Parish Church will be celebrated one hour earlier so that the squad can attend before departing for Croke Park to play in the all-Ireland club final. “It’s unique to change the time of the mass, I don’t remember it happening before,” says parish priest Fr Paul Dempsey, a keen supporter of the club. The earlier visit to mass will suit the team and supporters although Fr Paul wouldn’t miss the match for the world. Back at the club, excitement was building last Sunday as supporters gathered to purchase all manner of items to show their support ahead of the big game. Former first team ‘keeper Robert Kennedy, who’s now club PRO, and Clare Coyle had their hands full in the club shop on Sunday morning selling t-shirts, hats, scarves, flags, water bottles, pens, key rings, car fresheners and anything with the Two Mile House crest on it. Others like Eddie Julian and Des Healy chatted about how far they have come in a short space of time. Both men have poured their heart into the club and played a significant role in developing the young players that are now the backbone of the team. Their sons, both named Chris, will start in the forward line on Sunday. They are a great example of the youthful exuberance in the team and that feeling has spread from the pitch into every corner of the community, filling the chest of every man, woman and child with pride as Two Mile House prepare to visit the home of the GAA.